Hop behind the dj booth when there is a free space. You can search for tracks in a database and select it to your playlist. The djs play on from left to right and when you’re on, the song from top of your playlist is played next. 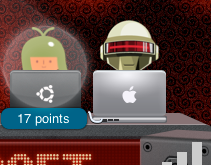 Everybody in the room can click “awesome” and the avatar starts dancing. If enough people push “lame”, the next dj is on. Simple idea, well done, playful interface, like I said: great fun! And there was this great moment also when one of he founders Seth Goldstein entered the room to see if everything was ok. We clapped his shoulder, congrats to turntable.fm, made some wishes (export playlist, real mixing) and let him step up to play one song. “Soldier” by DJ Cadim it was. 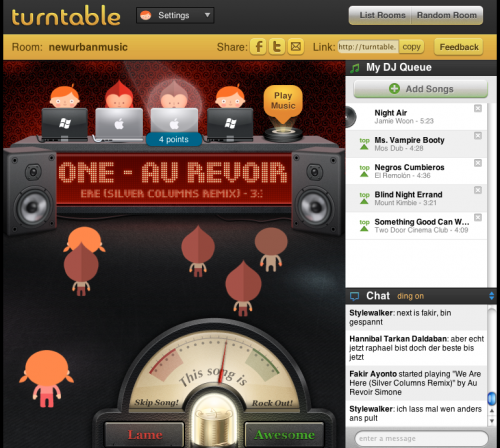 Good luck, Seth and turntable.fm! Thank you for showing me some music in a great session with Barbnerdy, Saetchmo, Silke, Fakir Ayonto, Uwe and others!